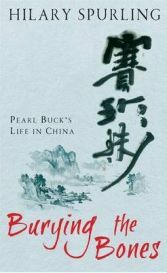 Pearl Buck was born to missionary parents in America, but the family moved to Zhenjiang in China while she was still very small and Pearl grew up bilingual – in many ways, she was more Chinese than English. Her father, Absalom Sydenstricker, was a determined man and although his beliefs were frequently rejected by the Chinese, he forged ahead with his teachings. Carie, his wife, supported him as best she could, although they often argued over what was best for the children. Pearl grew up into a determined young woman herself, who also became a missionary, although her views were much less forthright. Marrying John Lossing Buck, an agricultural missionary, she lived through one of the most violent periods of unrest in Chinese history, until finally forced to move to the US permanently in 1935. Apart from the fact that her experience of China and the Chinese people at that time was second to none, her main claim to fame is that she was an author, using her storytelling skills to educate the West about the ordinary Chinese people. Her most famous book, The Good Earth, won the Pulitzer Prize in 1932 and she was later awarded the Nobel Prize for literature. Her rich and varied life, particularly her formative years, has been beautifully written up in this biography by Hilary Spurling. Although not the only biography of Pearl Buck, it is the latest and is the most objective that I have read. It is also the best-written by a mile. Hilary Spurling is not a China expert, although she has written a number of biographies on famous people such as Matisse and Sonia Orwell. Nevertheless, the detailed research that she has obviously undertaken for the purposes of this book show an excellent grasp of Pearl’s Chinese/American psyche and her struggle to understand why the West couldn’t see that China was more than just a mass of people ripe for religious education. Pearl was a very lonely woman in some ways, because so few people around her had experience what she had, and yet her desire to show the West that the Chinese were not inscrutable and ‘heathen’ as was the common presumption at the time. This comes through strongly in the book and, although it doesn’t always show Pearl in a positive light, particularly towards the end of her life, it does win the reader over. Pearl Buck’s work, although fictional, is known to be largely autobiographical, with many of her characters a thin disguise of Pearl’s own thoughts and character. Spurling has made great use of this by using quotes from Pearl’s work to add colour to what she is saying. This really enables the reader to get under Pearl’s skin, because we don’t just have someone else’s view of Pearl, but we also have Pearl’s own view, albeit taken in the form of a quote about one of the characters in her book. Spurling has supplemented this with a great deal of other sources, however, including letters written to friends and family, papers on Pearl Buck that she has gained access to and interviews with friends and family who knew Pearl intimately at different points, including a couple of her adopted children. Some people may be concerned by the religious aspect of the book – Pearl was brought up a strict Southern Presbyterian and did become a missionary herself. Nevertheless, although this is acknowledged as something that affects Pearl deeply, it is not the focal point of the book. The only time it really comes to the fore is when Pearl questions the whole point of missionary work in China, for which she caused a political furore. Her point was that the Chinese didn’t need to be converted to Christianity in order to be saved. They needed advice on how to turn their economy around, initially through agriculture, which is exactly what her husband, John Lossing Buck, was working towards. This viewpoint is very similar to my own, and so I found it fascinating. However, there is little in the book that could offend anyone who doesn’t share this view. Hilary Spurling writes beautifully and with a flow that makes it hard to put the book down. Her ability to bring both Pearl and the events in China that coloured her early life is truly exceptional. I felt throughout that I was reading something that was educational and cultured, but, at the same time, wasn’t pretentious and could be enjoyed by anyone, whether interested in Pearl Buck and China or not. In the foreward to The Good Earth, Pearl Buck writes: ‘Surely books ought to be within the reach of everybody’. I think that she would be pleased with what Spurling has done with her biography, because it is full of human interest, told in language that is easily comprehensible. If only more people could write like this. I have just a couple of minor criticisms. One is the use of the Chinese language for names and places. Confusingly, there are two major types of transliteration used for Chinese; one is the Wade Giles system and the more modern is known as pinyin. Although the Chinese they are representing is pronounced in the same way, they can look vastly different. For example, China’s famous poet, Xu Zhimo as he is referred to nowadays, can also be known as Hsu Chih-mo. In Pearl’s time in China, the Wade Giles system was most commonly used, so it is understandable that many of the names and places are in this more old-fashioned form of transliteration. However, as time goes on, pinyin creeps into the narrative, without any real explanation. There is a table at the back of the book with a short list of the most common Proper nouns used and their equivalents today, but it isn’t really explained that there are two systems. It isn’t a major problem, but anyone with an interest in Chinese will notice it and, perhaps more importantly, it could convince anyone who doesn’t speak Mandarin Chinese into thinking that Chinese pronounciation is even more difficult than people already popularly believe. The only other criticism that I have is that I wanted to know more! Spurling mentions Pearl’s daugher, Carol, the only child to whom she gave birth, who suffered from a form of brain degeneration. This was an incredible blow because of the attitude of people in general to handicap and Pearl was given little choice but to place her in a home, where she visited her frequently, and used the experience to raise awareness of such problems. Pearl also adopted several other children, one with John Lossing Buck, Carol’s father, and the others with her second husband, Richard Walsh. They play a very small part in the book though and I would have liked to find out more about them and what happened to them. However, I appreciate that Spurling had to draw the line somewhere in order to keep the book at a readable length, so this is a very minor quibble and is actually a testament to Spurling’s fabulous ability to bring Pearl to life. This is an exceptional book that anyone with an interest in China and/or well-written biographies should ensure they read. Others will also be impressed by the standard of writing and the fascinating woman that Pearl Buck became. My interest in Pearl Buck has most certainly been awakened and I plan to re-read The Good Earth and Pavilion of Women, as well as some of her other books very soon. I have also been so impressed by Spurling’s writing that I intend to read some of her other work as soon as possible. This book is highly recommended. Published by Profile Books, April 2010, 352 pages. Thanks to Profile Books for providing a free review copy of the book. Read the mini-interview with the author by following this link. No Comments on "The Life and Times of Pearl S Buck"